Best Chinese Knives: CH Knives CH3505 3505 EDC Flipper Knife Review! CH Knives CH3505 3505 EDC Flipper Knife Review! I have received this knife as well and would like to tell you my thoughts about it. The knife came in a CH branded black cardboard presentation box wrapped in a nylon sleeve. It was great out of the box - blade dead centered, no blade play whatsoever (feels like a fixed blade), early but safe lockup, action was smooth and became even smoother with a drop of oil on the ceramic detent ball. One thing that wasn't perfect about it was the sharpening - straight but felt a bit unfinished. I took out my Lansky Turn Box and just with few slides on the ceramic rod and a quick stropping it became as sharp as a freaking Lightsaber! The knife didn't require disassembly, but I did it anyway (was curious about the construction). 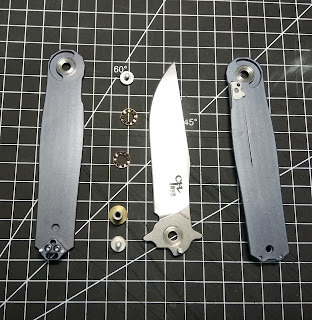 What can I say - you can add the CH 3505 to the CRKT Homefront line, cause it took me just a few seconds to disassemble it (2 screws and the thing was done). It has a very pretty unique construction (as can be seen in the picture) - internal stop pin that slides in the milled cutouts (the best kind of internal stop pin IMO), only the pivot screw is shown on the presentation side, the back side of the knife is held by the pocket clip screw that goes inside the backspacer that is anchored to the scale. Plus ceramic bearings in a metal cage and steel washers with pre-milled grooves in them to separate the bearings from the titanium. Definitely not a level of construction I've ever seen on a Chinese knife before (maybe only on a Rike knife). - Quality out of the box and in general. - The overall shape (concept) and the looks. - The details - such as the bronze colored washers under the pivot screws, sterile (only pivot screw is shown) presentation side, hidden steel insert, true open back construction and the lanyard hole. - The ti pocket clip is excellent. - Overall level of manufacturing, milling and anodizing. - The additional guard - gives an unique look to the knife, adds some character, acts as a guard and even can be used to deploy the knife using the thumb (not waveable though). - The blade profile and the sharpness (after touchup) - the CH 3505 has a great profile for cutting and a thin flat grind that makes it an excellent cutting instrument. - EDCability - the knife rides very well in the pocket, has slim profile and relatively low weight (95.4g /3.36 oz) for a 3.5" (91mm) blade. Overall length is 202 mm or 8". 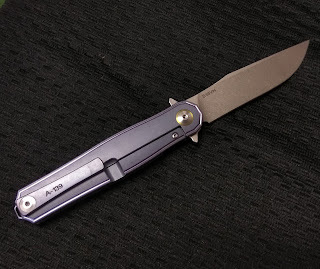 - S35VN steel - keeps a great edge with that thin grind and I have no reason to suspect it isn't that steel. - Action - very smooth on ball bearings (even better after disassembly, cleaning and lubing), flips fast and hard due to the right detent. Could be lightswitched and pushbuttoned. - Price - for all those great features and the fact that the knife has original design. the price is more than adequate. - The pattern on the presentation side - made well but I'm not gaga over it. - The fact that they started to number their knives on the pocket clip - good idea. but could have chosen a different, more subtle place to do so. - The pocket clip has some discoloration on the tip due to carry. - The ergos - are OK, but like with many other Kwaiken style knives are lacking due to the straight shape of the handle. - I like this knife a lot, more that I thought I would. There are knives that are better in person than on the picture and this is one of them. 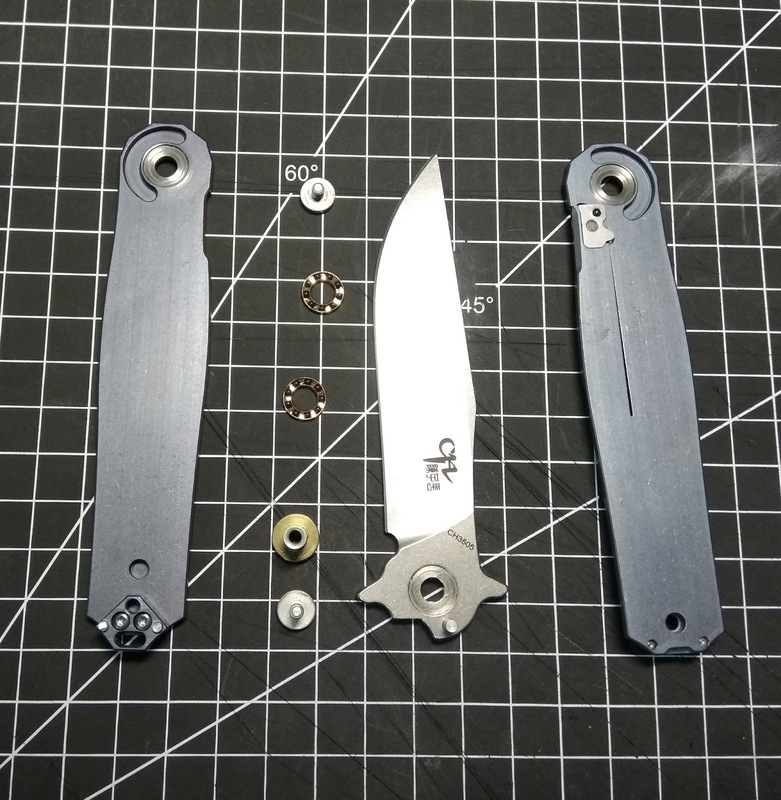 The build quality and engineering are top notch, real thought and design were used here and it really shows (no corner cutting like on many other Chinese knives unfortunately). I'm also excited to see what CH Knives will come up with next. Nice review on a nice knife, too. 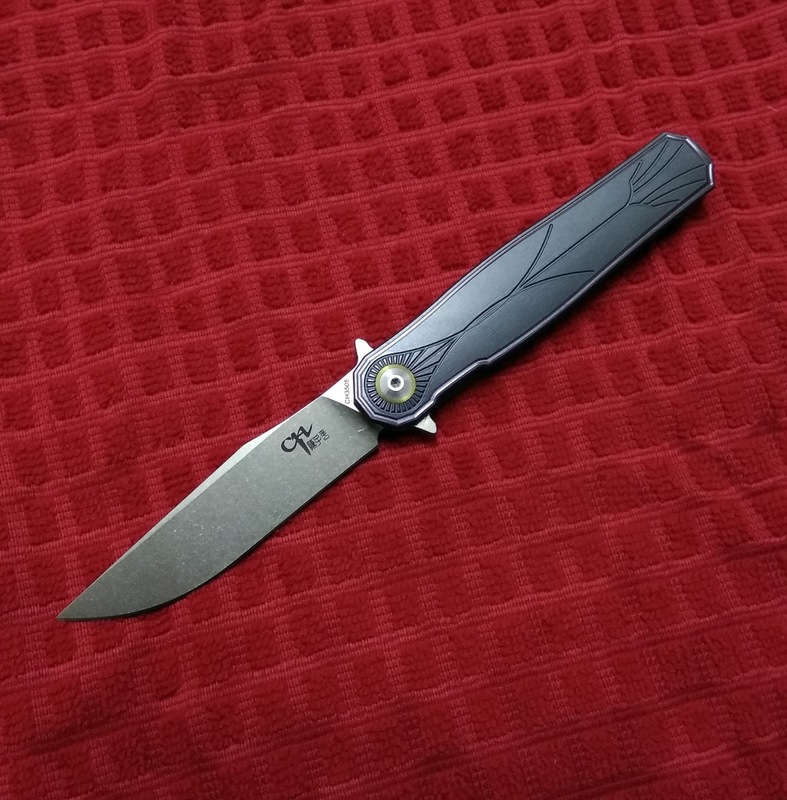 I think the Zieba clone has a similar construction. I only own the steel version but that has the same stop pin construction and only 2 screws. I guess the Ti version has steel washers, too. I know the coffin shaped handle and the bowie blade is a traditional pattern but I'd like to see this one with a dagger blade (false edged). A really symmetric folder would be interesting, even though the usefulness is limited. Zieba ones have another screw in the back (on the presentation side), but the internal pin construction is somewhat similar. I prefer this blade shape, as they really nailed down the grind here for cutting and slicing, daggers usually lack that ability. And of course a dagger isn't really usefull except stabbing folks, I was only thinking it would match the symmetric handle. Nice knife, no doubt about that. Neither this url: https://goo.gl/9qCUgM nor this url: https://goo.gl/Lyxirx are functioning for me. Maybe try with a different browser.